YEARS AGO, we tried to pose Holly for a photograph. She didn't want to sit on a tumbleweed. Nobody does. Tumbleweeds are a great American success story, if what we hear is to be believed (and I will hold out the possibility that the story might change, as historians love to learn more). If you ever see a western movie set before the late 1800's, or set before the trains went across the country, and if that movie has a tumbleweed rolling across the road, that is an anachronism. Tumbleweeds came with the railroads, on burlap bags that came from Russia. 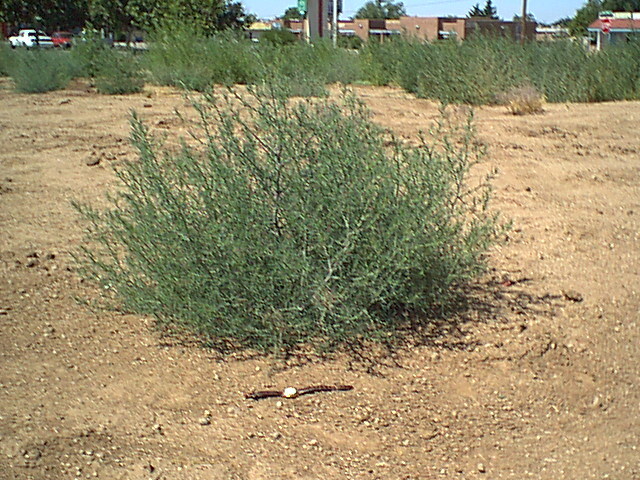 Tumbleweeds won't grow where other plants are already growing. They're "primary growth," which means they will be one of the first things to grow where the ground has been disturbed or plowed or scraped. All along the new railroads the ground was disturbed, and sand or dirt was piled up along the new tracks, and then they threw cargo off the trains, and some of the seeds got started and... woohoo! I have heard that in Russia there was a rabbit that ate the sprouts. They didn't bring the rabbits and throw them off the train. Maybe they should've. The idea for this page came from my finding some tumbleweeds growing in my yard right after an(other) online discussion of tumbleweeds. They're exotic and fascinating, but if they're growing in your yard and you've had many of the stickers stuck in you, they're obnoxious. This is another one I pulled up in our yard, and wanted to show how pretty the babies are. They're a nice color and they look almost edible, but nothing eats them around here as far as I've ever heard. Most of that red stem/root was under the ground, but as they grow the stem is red at first, when they do start stretching up. There's nothing the least bit red later on. So here are those two babies I'm saving to document. This photo was taken April 22. Here's a seedling with a more official scale of measurement than my finger. This is about life size. I suppose that's 20 seeds or so, though I've never really carefully examined the seeds because I never cared before now. Same two tumbleweeds as the two photos above, their progress as of May 1. I pulled other kinds of weeds out around them so you could see them better. I put a tomato frame on them too and told the others in my family not to pull them out. That's hard, to see a tumbleweed in the yard and not pull it. When they start to get prickly, it will be even harder to ignore them. I might have to build a fence and put up a sign. Hmmm... Those two are STILL small, a month and some later, so I've given up on them. Too much shade. Meanwhile, out in the vacant lot... FAT tumbleweeds, in dry land, but where it's sunny. The one to the right was photographed June 19, 2005, with my watch for scale. These can be clicked to enlarge. This is about a month old, and I left it growing so I could photograph it. The Flair pen is for scale. This is what it would look like if I were to lie on the ground and look at it with one eye, which I didn't want to do, but the camera could do fine. Here's how long the root is. As long as the plant is tall, and straight down. But when the tumbleweed glory days of fall come, it will dry up and separate right at the ground. I'm trying to let you see the color of the stem. 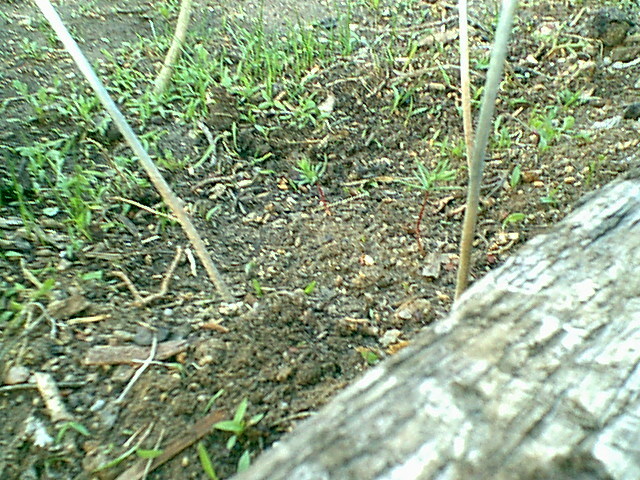 In the photos to the left, you can see the seedlings are light green with a reddish stem. When they're this age, the stem is stripey like a lizard, green and purple. That will all go to dark green later, and then dry up quickly to the classic tan. It's when they're dead that they really come to life. Profound, huh? The dead moms can travel miles, leaving seeds for their little babies who might be born to be pulled up and photographed for a web page. Probably not, but it has happened a few times. 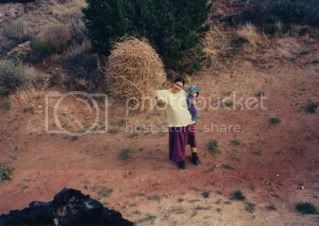 Thank you for the time it took you to build that page and investigate the tumbleweed babies. I enjoyed reading and looking. I like your tumbleweed page! Tumbleweeds are a real nuisance here in southeastern Washington. After we moved into our house, about 40 acres directly behind us was scraped of native growth and in one corner, a small grove of cherry and apricot trees. We've been able to watch the entire process from scraping the soil to the building of about 125 houses, with laying of sewer lines, etc. in between. Until this development came along, our backyard bordered on an area of native sagebrush and rabbitbrush, with the orchard in view in the distance. An odd change of events led to us (and everyone along our side of the street) getting our property line extended back by 25 feet. 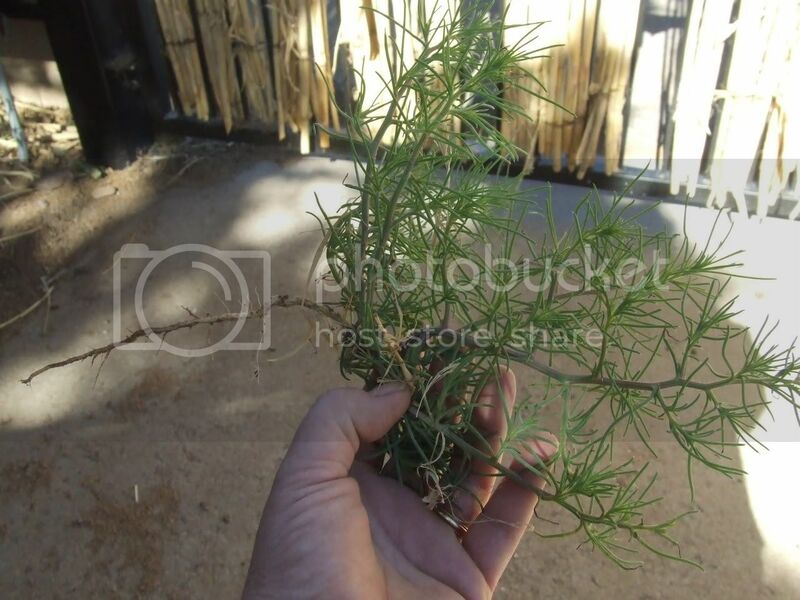 We moved our fence back to the new property line, but the extra 2500 square feet in my back yard was disturbed soil and the Russian Thistle (aka tumbleweed) had a grand time taking over. Everyone I asked for advice on how to get rid of it said to use chemicals. Instead, I spent many hours pulling the little and not so little plants. They are soft and pretty at first, but get prickly as they grow. 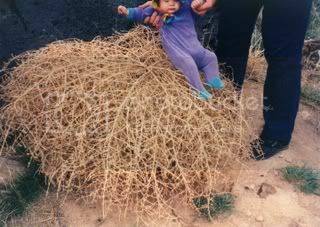 It's been a few years now and I've got other stuff growing back there, so I only rarely find a new baby tumbleweed. The local folklife society hosts an annual Tumbleweed Music Festival and Songwriting Contest. http://www.3rfs.org/tmf.htm It is a wonderful weekend of music on the banks of the Columbia River, and sometimes actual tumbleweeds blowing around. Scientific descriptions with good photos! 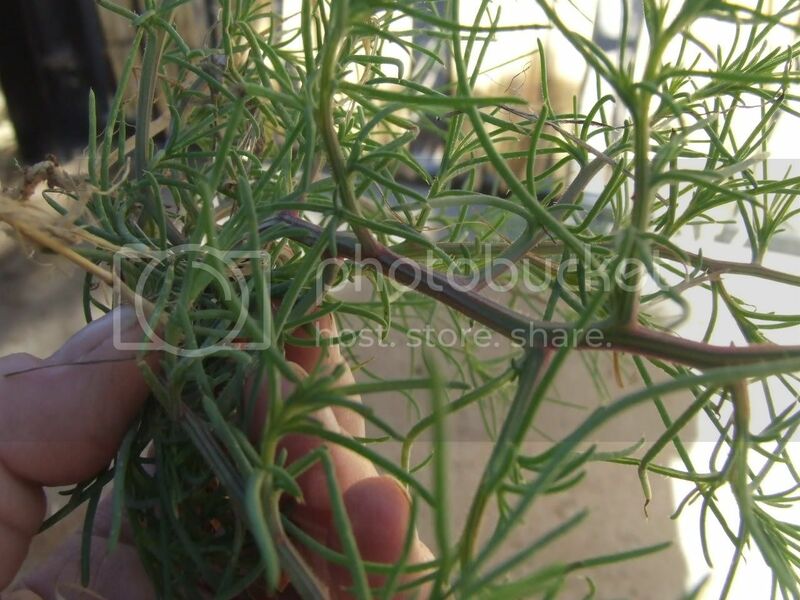 Find a tumbleweed to decorate with or just read about the great western tumbleweed. Videos, Photos, and Histories. Hmmm... These guys spray theirs with stain and polyurethane. That is unnatural. 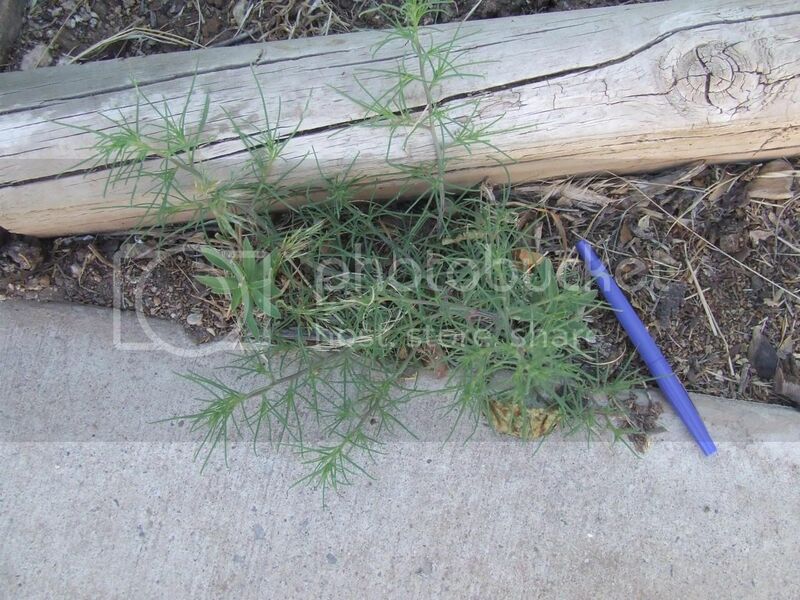 In the wild, tumbleweeds are not shiny or dark. They're almost whitish when they're dry, and are DRY. Interesting idea. I guess it makes them last longer, and if someone's going to pay FedEx prices for a 3' tumbleweed, I guess they would like it to last a while. 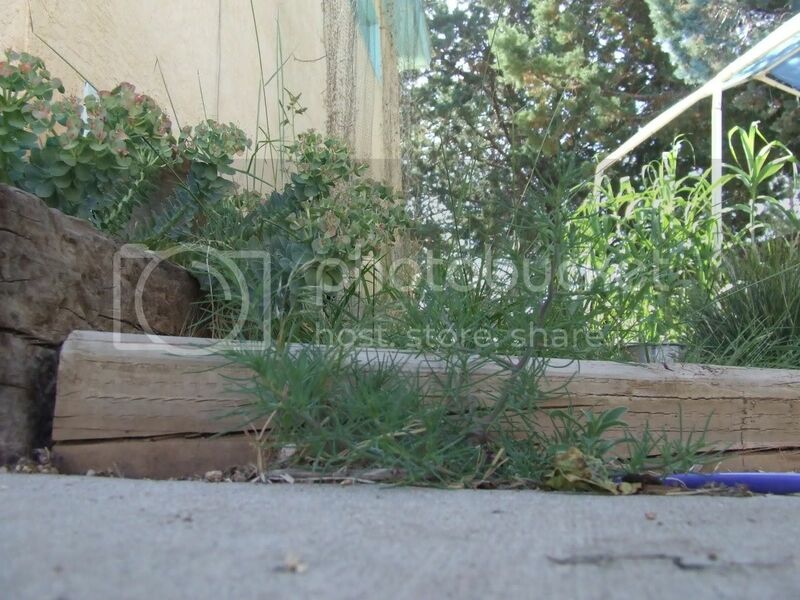 They do have a photo of a tumbleweed posed on a treestump, and it looks dry and whitish. It would make no sense at all to oil and plasticize a tumbleweed that wasn't bought and paid for yet. http://www.prairietumbleweedfarm.com/ These folks are selling Christian tumbleweeds (fish & cross marked site), and *organic* tumbleweeds. Not like those pesticide-laden tumbleweeds you get from... HEY. No human ever has fertilized tumbleweeds. It will probably kill them. They like sand and adversity. They like martyrdom. Like Christians. They're prickly and thorny, like any Christians who might complain about this paragraph will be. 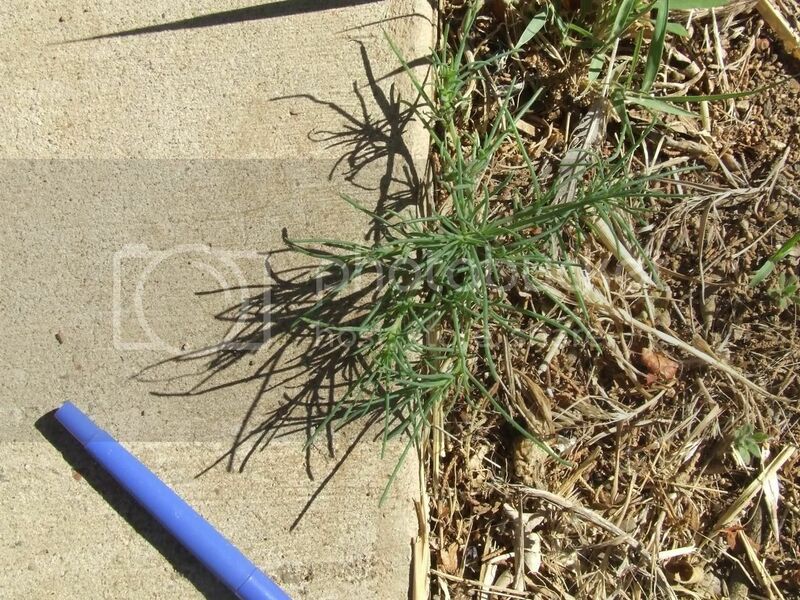 Another Christian tumbleweed site, this one in Texas,and this one also will sell you cotton (so you can see it in the boll and take the seeds out yourself, which is fun) and devil's claw! Devil's claw is a cool seed pod. It's BIG, and if you step on or in it, it can wrap around your ankle. I saw my first one in West Texas when I was a teenager, and it was sitting in the middle of a dirt road near Rotan, looking like a big SCARY bug. There's one in the natural science museum in Albuquerque (in the kids' hands-on room, in the "what the heck is THAT!?" area). These aren't expensive. I might buy some for my kids to scare their friends with. We could make a mobile. 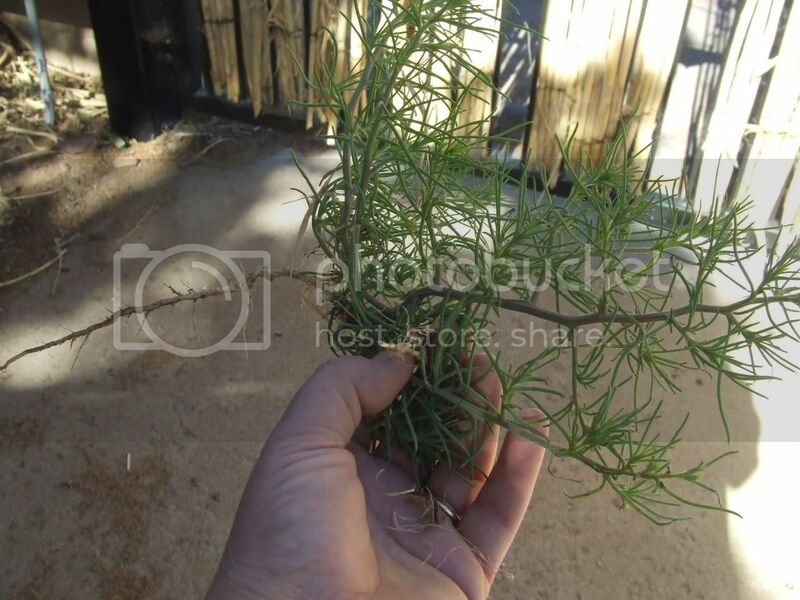 Here's their photo page with green, grown and seedling tumbleweed photos. Using tumbleweeds to help neutralize or deplete uranium?! An article about the third-listed sales site above, about the origin and surprise success.